A major winter storm will strike the Midwest and much of the country Thursday, effecting over 150 million people by the time Friday rolls around. 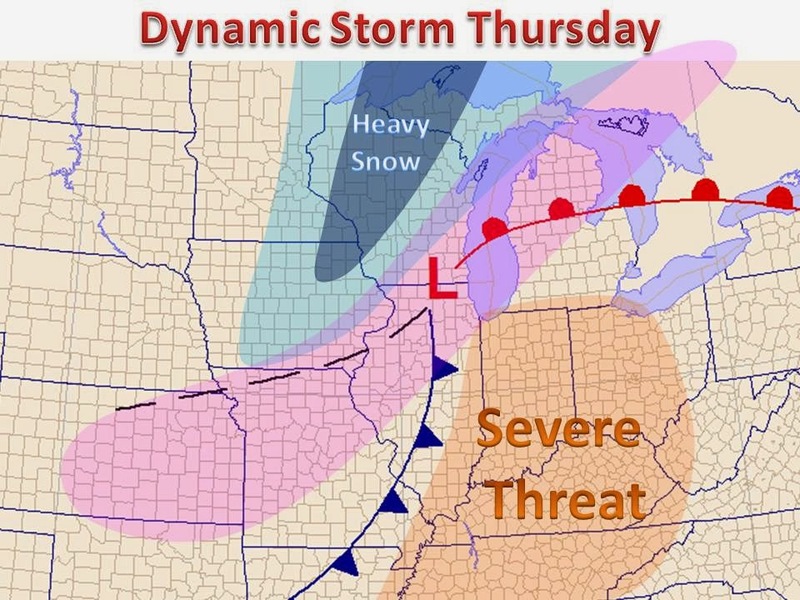 This system will bring everything from warm to cold temperatures, from heavy snow to flooding rains to severe weather. It will prove to be a text book Spring-like area of low pressure. Models are still trying to pin down the track (which will play the largest role in who sees what). 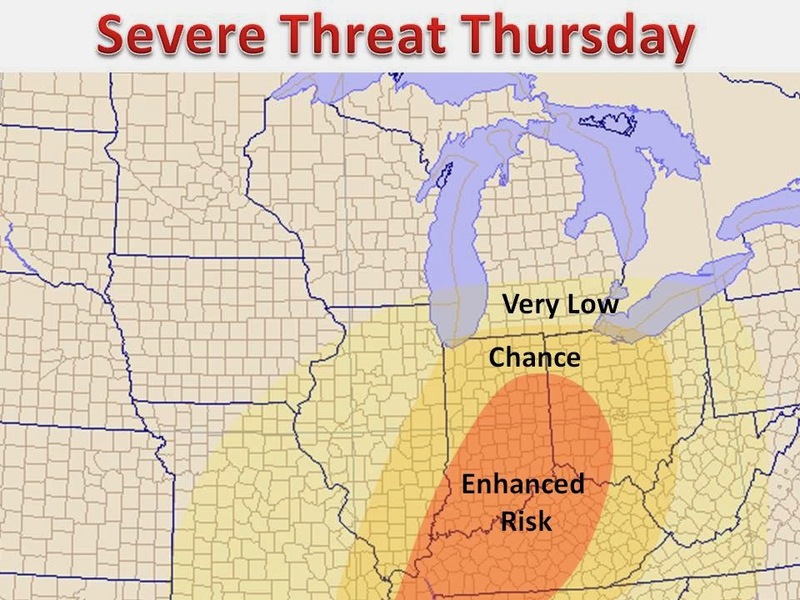 On the left you see a map of anticipated weather phenomena for Thursday. Heavy snow in Wisconsin, and severe weather south, a mix in between. On the warm side, this storm looks to bring the first real severe weather threat of the season. As warm gulf moisture crashes into yet another surge of arctic air (yes the cold will return in full force by the end of the week). The main threats look to be heavy rain and large hail, with damaging winds also possible in many areas. The highest threat, at this time, appears to be in the Ohio River Valley where the best atmospheric dynamics will set up. It will be interesting to see how the snow cover effects and possibly limits severe weather potential on Thursday. 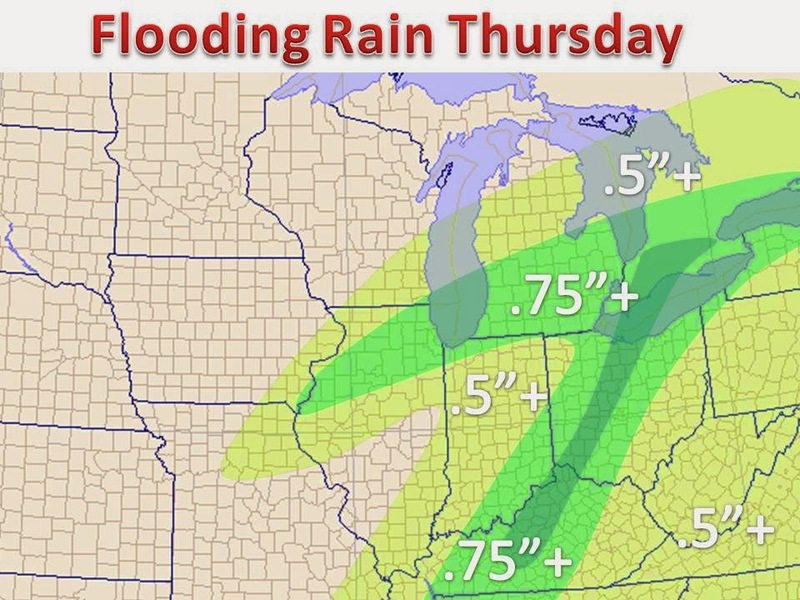 No matter what, heavy rain will be a major issue on Thursday. Not only will many locations see over a half inch of rain, the record breaking snow depth will play a major role in flooding. Be sure to pay attention to your local flooding advisories. Furthermore, you may want to consider shoveling snow off the roof as roof collapses will likely occur as heavy rain is soaked up like a sponge on the roof of your home or business. It is an issue every year with storm like this, and can be fixed with a preemptive strike.